Teeth cleanings at the dentist typically cost $85 and up and dental insurance often limits the number of covered teeth cleanings per calendar year. Periodic at-home tooth polishing sessions with these oral hygiene tools can keep your teeth white and free of stains and plaque build-up between visits. You can avert the high expense of deep dental cleanings with these battery-powered dental polishers and polishing pastes designed for home use. The Momi and Dazzle Luxe home dental polisher kits are the best value of all consumer tooth polishing sets currently available. Using the same OEM polishing motor/housing as the Polish'd and Dentek polishers, the Violife Dazzle Luxe system includes extra polishing tips: Both an extra polish cup and a pointed polishing cone. Packets of gritty professional-quality mint flavored polishing gel are also provided. Other than two AAA batteries, everything you need to keep your teeth white and free from placqe build-up for months to come is included in the box. The Momi dental polishing kit includes 2 batteries and more replacement tips giving the edge as a slightly better value. Currently the Violife Dazzle Luxe Polishing Kit has all the right features you'd want in a battery operated home dental polisher. It has a dual-speed polisher motor, a long polishing neck for getting at the back and inside of your entire mouth, multiple cleaning tips, professional-grade propy polishing paste, and a carry case. Just as important, you can readily find and purchase; 1. Separate replacement rubber tipped polishing heads (both cup and pointed interdental) as well as 2. polishing paste refill sets. That makes the Dazzle Luxe dental polisher a product designed for a longer usable life-span. Do note that sadly, 2 x AAA batteries are NOT included in the polisher's packaging. A recent addition to the options in an electric tooth polisher is from DenTek and offers a complete kit with polisher, cups of whitening gel and extra replacement tips. For around $35 USD, it's far more affordable than the Violife. But what you don't get is the option of purchasing separate, replacement polishing heads. The reality is the plastic drive shaft is likely to wear out or break long before you'd ever run out of the extra polishing tips. So without the option of replacement heads, consider this a great value - but more 'disposable' oral care product. This elecric tooth polisher uses 2-AAA batteries which are NOT included. Also it comes with a whitening GEL - not necessarily gritty polishing paste that's needed for serious stain and placque removal. The fact that the affordable OraTek Dental Polisher includes additional polishing cup heads is a definite plus, though do note they're plastic and not rubber. Polishing tips do wear out after several thorough cleanings. It also has a motor that will stop spinning if you're applying too much pressure, which is an important feature. Batteries are included for immediate use right out of the packaging. Some ship in a combo package bundled with some dentist-grade high-grit cups of professional polish as well. It's main drawback is having the large, chunky motor atop the tooth polisher handle. With no extension tip on the polisher head, it's too big for many users. It makes a wide open mouth and jaw essential for trying to reach into back areas of the mouth. It's less easy to use than other types of tooth buffers that have a slim, tapered polishing head. 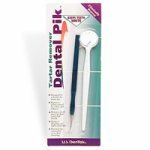 As such, this cheap and readily available tooth polisher (also packaged as 'AZDent' or 'The Doctors' brands with either white or blue plastic) the Oratek is effective for polishing ONLY your frontmost and outer side of your teeth. You'll find it difficult if not impossible to thoroughly polish inside your dental arch, or to even reach your back molars. For a cheap and basic dental polisher and removal of stains from front and outer teeth, it's functional enough for it's low price and will help remove plaque and staining in your most visible smile zone. Recently discontinued, the OraWave tooth polisher is getting hard to find which is unfortunate. The rubber polishing cup on the Orawave Power Whitener Toothbrush and Polisher gets around the edges of gums and between your cuspids, molars and incisors just beautifully. With it's tapered, right-angle head, it reaches all the way back in your mouth with ease. The inlcuded dual-brush head removes soft build-up better than most tooth brushes. Unfortunately, snap-on replacement rubber cup polish heads are NOT available. You'll need to replace the entire unit when the tooth polisher head wears out. Keep your teeth polished, clean and white in-between Dentist appointments with this selection of home tooth polishers and dental cleaners. They'll help keep your teeth free from plaque build-up and remove of food, beverage and tobacco stains. Explore our specially chosen selection of dental cleaning and oral care tools. Gently using a pick to remove tartar and placque build-up between teeth and around the gum line before your polishing is wise. Doctor Toofy is a patient of a Dentist in Palm Springs California - Kirit Patel DDS at his South Palm Springs Dental Office: PalmCanyonDental.com - Someone I trust my routine oral and cosmetic dental care to when in the Desert Cities.